Hello everyone, it’s been a while since I’ve last written an article. But the release of Guilds of Ravnica, combined with the all-new standard format has sparked my interest in Gentry again. The modern PPTQ season is also over, so all the factors are there to switch my attention back to standard and Gentry. I’ve been on the brewing side of things for a couple of weeks and today I would like to share one specific deck with you. Followers of the current standard format will recognize most cards from the Golgari midrange deck that’s a big part of the metagame right now. That’s not a coincidence because that’s just the way I build my Gentry decks. Brewing a deck from the bottom-up isn’t really my best skill, as I am better in just porting decks from Standard and finding the best commons and uncommons to replace all the rares and mythics. It’s been 3 years since we had Elvish Mystic and that card was pegged as one of the best cards in Standard back then. Llanowar Elves is easily the best turn 1 play you could have. It ramps to your big spells and allows you to double-spell in the same turn easier. In the mid-game, it’s an excellent chump blocker or sacrifice fodder for your Vicious Offering. You play 10 explore creatures to accompany this card. Getting it to a 3/5 or even a 4/6 shouldn’t be too hard and the card really shines against mono-red. Just be careful not to just slam it on turn 2 against any aggressive deck with Lightning Strike. Instead, wait for the turn when you can cast it together with an explore creature to get it to that magical 4 toughness. Llanowar Elves makes this possible on turn 3. I’ve ranked them together because they’re essentially what makes the deck tick. These cards find you your land drops, they smooth out your draws and they fill up your graveyard. All the while you’re also adding to the board and hopefully even getting some triggers from Wildgrowth Walker. A good aspect of the explore cards is that they allow you to see more cards of your deck. 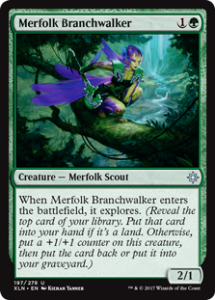 This is especially important in Gentry, because you want to find your rares and mythics every game. One tip I can give you when trying this deck out, be aggressive with putting creatures in your graveyard. You do have some synergies there with the graveyard but we’ll get to that topic in a moment. Only 2 copies of Whisper Agent because the double black makes it impossible to play it on turn 2 with Llanowar Elves. Basically it’s another common filler card that has some good synergies with the overall strategy of this deck. That’s what you have to work with when you spend half of your uncommon slots on explore creatures. Still, I like everything this card does. It’s a reasonable body on its own and the flash aspect can surprise some opponents. The Surveil 1 is basically another way to smooth out your draws even further and fill up your graveyard. 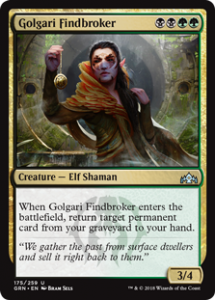 Elvish Rejuvinator was basically the 60th card that was added to the deck. The 15 uncommon slots were already filled up so I had to get a little…creative. The basic idea is that this card allows me to get a 5 drop on turn 3 when paired with Llanowar Elves. This will happen probably once in a blue moon, but when it does it’s going to be a devastating play. Can you imagine turn 3 Doom Whisperer or The Eldest Reborn? I accidently stumbled upon Rhizome Lurcher after splashing 2 copies in a Dimir deck at the latest Sealed PPTQ. The card performed very good as a late game finisher, as it’s mostly the biggest creatures on the board. This made me wonder if it’s good enough for Gentry. Of course just playing a 2/2 for 4 mana is no big deal so I’m aiming to play this card in the later stages of the game, when my graveyard is filled up with creatures. The idea is that the various explore creatures and the Vicious Offerings will help accomplish that. It’s also the reason why I’m playing a lot of creatures in the deck. During deckbuilding, whenever I had to make a choice between including a spell or a creature I went for the creature side. The inclusion of Whisper Agent is a perfect example of this. Basically, I’m a happy man if I can get it to a 5/5 and everything beyond that is a bonus. Only time will tell if this card is good enough for constructed play, but it’s the card I’m most interested in trying out. If you have tried this card out in Gentry, please reach out to me on facebook and let me know your thoughts. Ravenous Chupacabra has proven itself time and time again and it’s a natural fit for a midrange deck like this. Killing a creature and leaving a body behind is exactly what you want. I certainly don’t mind killing an Enigma Drake with this, and then sacrificing it with Vicious Offering to kill their follow-up Crackling Drake. 4 copies of Vicious Offering might seem a little much, but we don’t get the luxury of playing multiple copies of Assassin’s Trophy or Vraska’s Contempt like we do in Standard. The card does serve a few roles. It can clear out an early creature like Adanto Vanguard or you can use the kicker cost to take out something bigger like a Crackling Drake. Doing that will also fuel your graveyard to make your Rhizome Lurchers bigger. If we take a look at the Standard Golgari deck we see that it plays a wealth of big mana cards that generate a lot of advantage. 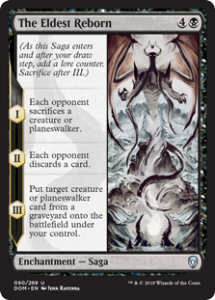 Sadly, multiple copies of Vivien Reid, Vraska or Find//Finality are a bit more difficult to play in Gentry so we have to look for alternatives. Luckily, Dominaria provided us with The Eldest Reborn, which basically does everything the deck wants. You make them sacrifice a creature, then they lose a card from hand, and finally you get the biggest creature (or planeswalker) in the graveyard back. Especially the 3d chapter synergizes very well with all the exploring you are doing. One downside I can see is that the first chapter is going to be really bad against token decks, but it might still be worth playing because chapter 2 and 3 very much make up for that. 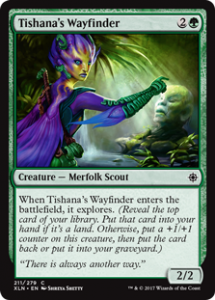 • Vivien Reid: This planeswalker serves both as a card advantage engine and an answer to problematic cards. Crackling Drake and Enigma Drake come to mind, as does something like Experimental Frenzy or an opposing The Eldest Reborn. Without Vivien and Vraska the deck is a little weaker against artifacts and enchantments. Also, have you read the ultimate?? • Vraska, Relic Seeker: Another source of card advantage but this one also protects itself by creating a blocker. The minus also can destroy everything that’s annoying you. • Izoni, Thousand-eyed: Another big pay-off for having a lot of creatures in your graveyard. This card can come into play with 4-6 tokens, which can then be transferred into more cards. Not many decks will be able to overcome that amount of card advantage. • Doom Whisperer: I’m not sure about this one, there might be better options out there but the card really is very strong if you can drop it early. The activated ability also makes any Rhizome Lurchers you play huge and it can dig you to your other rares. Wildgrowth Walker can buffer your life total a bit so paying 2 life should be less painful. – Carnage Tyrant: Better against control decks with more removal, but a liability if the control player also has the Drake package. – Find//Finality: Really not sure if this should be in the main deck or not, but the first half has a bit of anti-synergie with the Rhizome Lurchers. The second half is really game-breaking though. 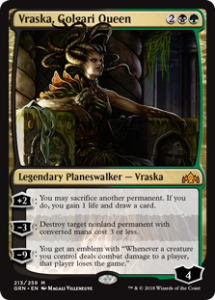 – Vraska, Golgari Queen: Another planeswalker where the minus ability will take care of most problematic cards. I’m not sure if I always want to sacrifice something with the +2 ability so it didn’t make the cut. – Karn, Scion of Urza: I think this is the 4th Planeswalker you will include. Vivien Reid and the 2 Vraska’s are better in my opinion but if you really want to go overboard with planeswalkers, go nuts! – Midnight Reaper: If you want to go a little lower in your curve and still draw some cards this seems like a fine inclusion to me. It’s just that the current build favors big bomb-like rares at bit more. – Underrealm Lich: I believe this is Doom Whisperer‘s little brother, albeit a lot less powerful. If you’re in the market for more card selection or just want another powerful 5 drop I wouldn’t fault you for including it. There might be a version of the deck that maxes out on Elvish Rejuvenator with the goal of dropping any powerful 5 mana card on turn 3. In that deck I can see focusing your rares at the 5 mana slot. Getting creatures back from the graveyard creates some tension with the Rhizome Lurcher. It also occupies the same slot in the mana curve, so omitting this card felt like the natural thing to do, instead, I went with The Eldest Reborn as my source of card advantage. The lifegain could be relevant, but not being able to kill anything with more than 2 toughness is a liability. The deck already has a good match-up against red decks so Vicious Offering got the spot in the main deck and Dead Weight got the spot in the sideboard. The same argument goes for Cast Down. I already have 2 Edict effects with the Eldest Reborns and I value Ravenous Chupacabra higher. If people are playing more Hexproof creatures like Vine Mare and Carnage Tyrant I could see adding maybe 1 or 2 to the deck. Sadly, all the uncommon slots are used up so there is no more space for Golden Demise. Mephitic Vapors is an acceptable alternative which will come in against any deck that’s aiming to go wide. I heard a mono white weenie deck went 4-0 at the latest leaderboard in Ghent and this card should be backbreaking for that deck. At the moment, 1-2 copies might come in against mono-red to combat Flame of Keld. Other than that, I still need to learn the metagame a little bit more to know what decks I want Naturalize against. Saga’s like The Eldest Reborn or Song of Freyalise could pick up in popularity. Some additional removal against decks that look to go under me. Also, it can shrink bigger creatures in the midgame so there’s some additional utility there. As long as I can remember Duress has been the perfect sideboard card against any control deck. This hasn’t changed one bit and I will happily bring all 4 against all those Jeskai and Izzet decks. If I see a lot of planeswalkers from my opponent I might even bring in some copies against other decks.